Bittersweet Enchantment: Blog Tour & ARC Review: The Last Academy by Anne Applegate + Giveaway! 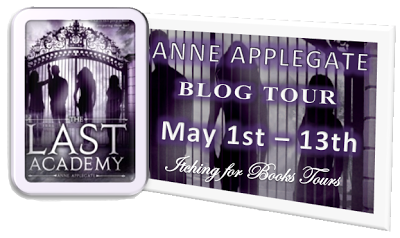 Blog Tour & ARC Review: The Last Academy by Anne Applegate + Giveaway! Hello my wonderful readers! Welcome to The Last Academy by Anne Applegate blog tour hosted by Itching for Books. I'm so super excited to be a part of this tour and to be able to share my review with you all. I hope everyone will really enjoy reading my review and love The Last Academy as much as I do. Camden Fisher arrives at boarding school haunted by a falling-out with her best friend back home. But the manicured grounds of Lethe Academy are like nothing Cam has ever known. There are gorgeous, preppy boys wielding tennis rackets, and circles of girls with secrets to spare. Only . . . something is not quite right. One of Cam's new friends mysteriously disappears, but the teachers don't seem too concerned. Cam wakes up to strangers in her room, who then melt into the night. She is suddenly plagued by odd memories, and senses there might be something dark and terrible brewing. But what? The answer will leave Cam—and readers—stunned and breathless, in this thrilling debut novel. 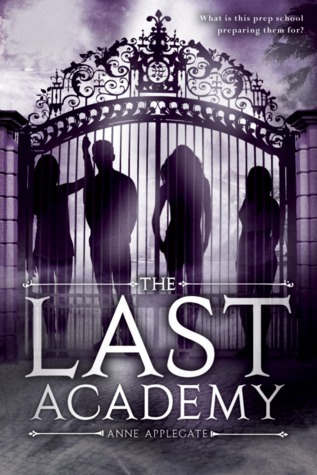 The Last Academy might very well be one of the hardest book for me to review. Here's why. 1. The reader will not understand ANYTHING about what's going on until about 3/4 of the book is already done. Me: "Wait, what?" - "Umm... that made no sense" - "How is the world is that even possible?!?" 2. I don't and will not spoil the ending! Nope, not going to do it! After Camden Fisher (or Cam) has a huge falling out with her long time best friend, Lia at a pool party. She decides to try to forget Lia and focus on packing her things for Boarding School. Cam is determined to start a new life, with new friends, and somehow forgot Lia. Before she even arrives to Lethe Academy strange things begin to happen. Now there, she is taken back but how perfect everything is seems to be. Cam wants to fit in, make friends (even a boyfriend), and focus on her schooling. As Cam meets the students (and the hot boys), teachers, and takes in her new surrounding that is when the weird things all start to happen. Late night visitors (who nobody sees), students go missing; never to return. Cam swears she sees things that just ain't there. She has so many unanswered questions.... What really is Lethe Academy? Why are all these weird, unexplained things happening to her? And where do her missing friends really go after they leave? The answer will not only shock Cam but the readers of the book as well. I have never ever, ever, EVER had a book give me head to toe goose bumps while reading. I not only was stocked by the ending, I just loved how everything just seemed to fit into place which literally left me breathless. I was so engrossed in reading the end I forgot I had to breathe to survive. haha (true story) Now to be completely honest when I was half way through, a good 180 in I was planning on giving The Last Academy a 3 STAR rating. But the ending.....*shivers* makes this book!!! The story was such a enthralling thriller that had me on the edge of my seat long after the last page. Anne Applegate is a beyond brilliant author. This book made me mad, excited, happy, crying and above all else FREAKED ME OUT! But in the best possible way. Now while I am focusing lot of this review on the ending of the book, when you read it you will see why. I can't tell you more about the other area but let me say EVERYTHING about the story is just WOW! I most definitely recommend The last Academy to my readers and to anything who loves a good thriller. To be enter to win a finished copy of The Last Academy please use the rafflecopter form below to enter. Giveaway is open to ONLY US residents. This sounds very interesting! The fact that you can't say anything makes me want to read it more and more. The book sounds so intriguing. There is mystery and paranormal involved. I want to know what secrets the Academy is hiding.